An April 25, 2016 article published by Alternet urges its readers to watch EXPIRED? Food Waste in America. “Watch: Date Labeling Confusion Causes Food Waste, Consumer Uncertainty,” written by Stephanie Van Dyke, looks at the Montana milk law that is highlighted in the documentary. Read “Watch: Date Labeling Confusion Causes Food Waste, Consumer Uncertainty” in full. 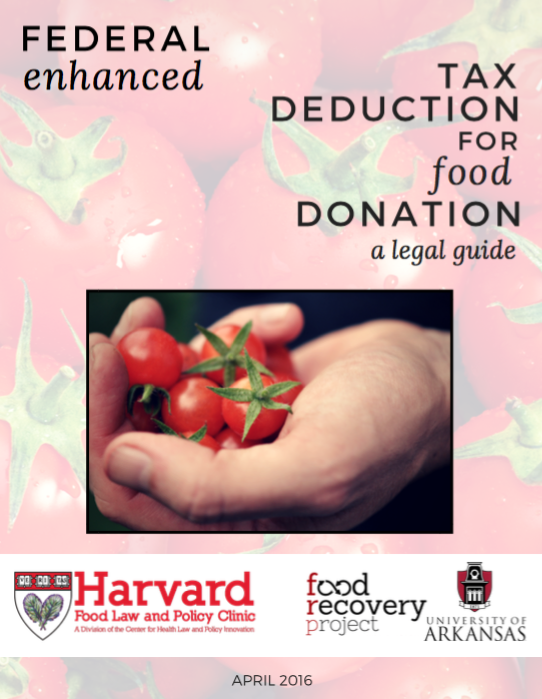 The Harvard Food Law and Policy Clinic, in partnership with the Food Recovery Project at the University of Arkansas, is pleased to published an updated version of “Federal Enhanced Tax Deduction for Food Donation: A Legal Guide,” to reflect the significant changes Congress made as part of the fiscal year 2016 omnibus budget that increase tax incentives for food donations and prevent food waste. This guide, originally published in November 2015, provides an important resource for food businesses and food recovery organizations to determine whether a food donor is eligible to receive the enhanced deduction. An estimated 40 percent of food produced in the United States goes uneaten; at the same time, more than 14 percent of U.S. households are food insecure at some point during the year. Diverting a fraction of the wholesome food that currently goes to waste in this country could effectively end food insecurity for all Americans. The extension and modification of the charitable deduction for contributions of food inventory included in the 2016 omnibus budget contains four significant changes: 1) a permanent extension of the enhanced tax deduction for food donations; 2) increases the deduction’s cap to 15% of the donor’s net income; 3) provides certain taxpayers a new optional formula for calculating the enhanced deduction; and 4) provides a formula for determining the fair market value (FMV) of food inventory. Each of these are reflected in the updated legal guide and explained in detail in FLPC’s previous blog post. Given the significant negative impacts of wasting food, more food businesses should consider donating their excess, wholesome food. This guide hopes to encourage more food donation by shedding light on how the federal enhanced tax deduction makes food donation a more financially feasible practice for certain businesses, and what businesses need to do to be eligible for this enhanced deduction. FLPC is also working on a policy paper that details various recommendations for the federal government to utilize policy change to encourage more donations of healthy, wholesome foods, including expanding and upgrading this enhanced tax deduction. In addition, FLPC will publish a food recovery toolkit targeting state and local changes to increase food recovery, such as effective options for state-level tax incentives to further support food donation. Look for these two publications in spring/summer 2016! I have been a clinical student in the Food Law and Policy clinic since January 2016. As a continuing clinical student this semester, I have been working on FLPC’s food waste and food recovery initiatives, including work on the clinic’s expiration date project. As part of its efforts to standardize date labels at the federal level, FLPC has drawn attention to this problem through the creation and promotion of a short film, EXPIRED? Food Waste in America. The film tells the story of how a restrictive date labeling rule in Montana has required countless gallons of wholesome milk to be needlessly discarded once the milk reaches a labeled date that has no basis in safety or science. Montana’s rule is just one example of similarly restrictive rules in place throughout the country. Throughout the semester, I have worked to promote the film and raise awareness about the connection between date labels and food waste. Two weeks ago, I traveled to Washington, D.C. with the clinic to attend a number of events related to our date labeling projects, including two screenings of the EXPIRED film in two very different settings. On Sunday, I helped give a presentation on date labels at the National Food Recovery Dialogue hosted by the Food Recovery Network. 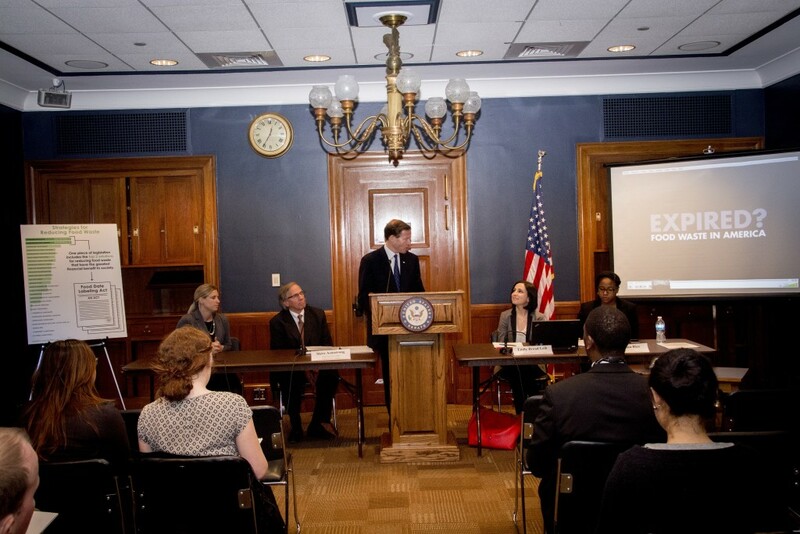 On Tuesday, FLPC’s director Emily Broad Leib and clinical fellow Christina Rice participated in a panel on date labels hosted by Senator Richard Blumenthal’s Office. 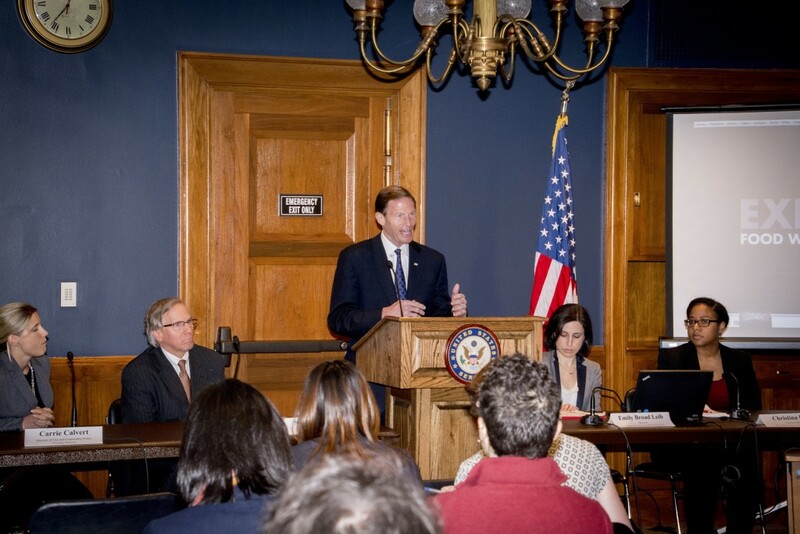 Senator Blumenthal has announced plans to introduce legislation to standardize date labels at the federal level, an effort FLPC has supported throughout the process. The panel on Capitol Hill had a very different audience: the event was largely attended by Congressional staffers, although other people with an interest in food waste and food recovery also attended. The panel began with remarks from Senator Blumenthal, followed by the EXPIRED film, presentations by the panelists, and a moderated question-and-answer section. The most interesting part of this event for me was the diversity in voices and backgrounds on the panel. Because date labels play an integral role in consumer confusion and food waste, parties ranging from environmental groups, to anti-hunger organizations, to food manufacturers and retailers, may all be invested in standardizing date labels, which could lead to powerful alliances and widespread support. At the same time, however, each of these groups approaches the issue with slightly different priorities. For example, Steve Armstrong, chief food law counsel at Campbell Soup, was concerned about making sure clear standards existed for scientifically dating different types of foods. Carrie Calvert, director of tax and commodity policy at Feeding America, was most concerned with confusion among food bank volunteers and recipients about what food is good to eat, and therefore seemed particularly invested in the educational components of date label reform. 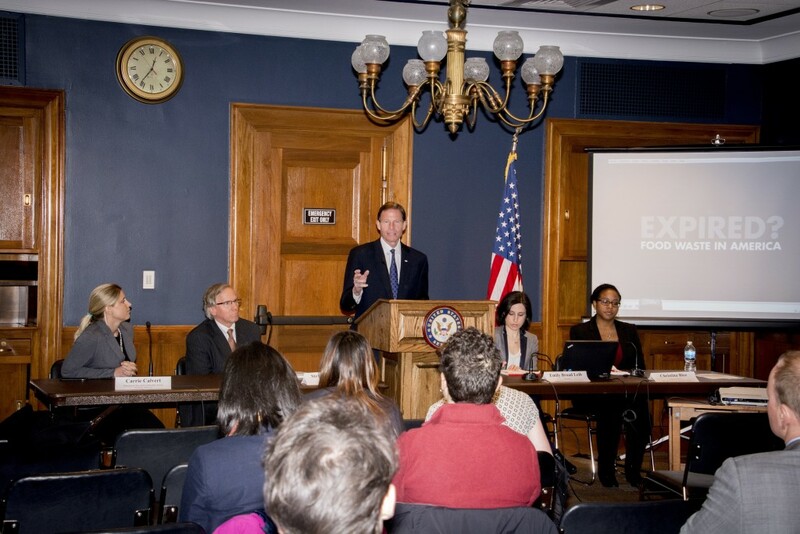 Ultimately, the range of concerns expressed at the panel reminded me of the importance of events like the panel hosted by Blumenthal, or the National Food Recovery Dialogue, both of which brought together people from different sectors. These events allow parties to identify places of overlap and form collaborations outside their normal circles, and to discuss areas where priorities may differ, or where different groups may be able to educate one another. These events also reinforced the importance of tools like our film, which we were able to use to inform these very different discussions. I am grateful to have spent four days hearing from students, non-profit leaders, and congressional staffers motivated by various concerns to address this country’s date labeling problem. I hope that learning about their different priorities helps me connect with a broader audience as we continue efforts to reform date labels. Written and original published by the Pittsburgh Food Policy Council. Since January, the PFPC, along with Pittsburgh Public Schools (PPS), have been working with the Harvard Food Law & Policy Clinic to produce a report of current laws & policies, as well as best practices related to the school food environment. Specifically, the Clinic – working from the great groundwork PPS Food Service has laid – is researching fundraising policies, share table practices, farm to school policy, and incorporating nutrition education into curriculum. At the end of March, the Clinic Team, comprised of Ona Balkus (Senior Clinical Fellow/Attorney), Emma Clippinger (Clinical Fellow/Attorney), Daniel Edelstein (Law Student/Clinic Intern), and Henry Thomas (Law Student/Clinic Intern), rounded out their research with a visit to Pittsburgh. 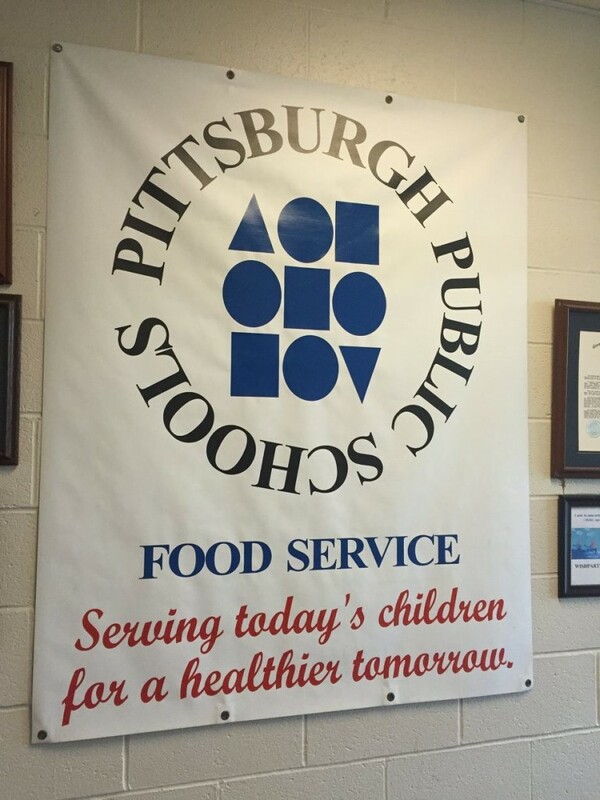 Along with PFPC Members from Let’s Move Pittsburgh, Grow Pittsburgh, MPowerhouse, Just Harvest, and 412 Food Rescue, the Clinic spent time touring the PPS Food Service Center, and meeting with the Food Service Director, Coordinator and Dietitian. Following this visit, the group held conversations with Montessori (Friendship) and Dilworth (Highland Park) Wellness Committee parents as well as University Prep (Hill District) Student Envoys who have been working with faculty and staff to improve the school lunch environment in those schools. Finally, our roving crew visited breakfast and lunch programs in action at Beechwood K-5 and Allegheny Middle School (Allegheny-West). We ended the visit with a tour of Community Kitchen Pittsburgh to learn about alternative models of institutional food service delivery taking place in Pittsburgh. We feel grateful here at the PFPC to have had this opportunity to work with Pittsburgh Public and the Harvard Food Law and Policy Clinic, and cannot express our appreciation to those who helped coordinating their visit. Stay tuned for the final report, coming this summer! View more images from FLPC’s visit to Pittsburgh. On Wednesday, April 20, 2016, Fox Illinois aired a news segment titled “Toss or Not: What To Do with Expired Foods.” The segment included data points from Harvard Food Law an Policy Clinic’s 2013 report, The Dating Game: How Confusing Food Date Labels Lead to Food Waste in America. The latest in a series of articles and op-eds from the Boston Globe, “Hepatitis C patients often have to get sicker before insurance will pay for drugs,” delves further into the Massachusetts health insurance marketplace and the various insurance providers who have placed restrictions on access to the Hepatitis C cure, despite recommendations from national health organizations to provide the cure widely. The article, published on April 19, 2016, cited CHLPI’s findings on the state’s marketplace offerings from the 2016 Qualified Health Plan Assessment. 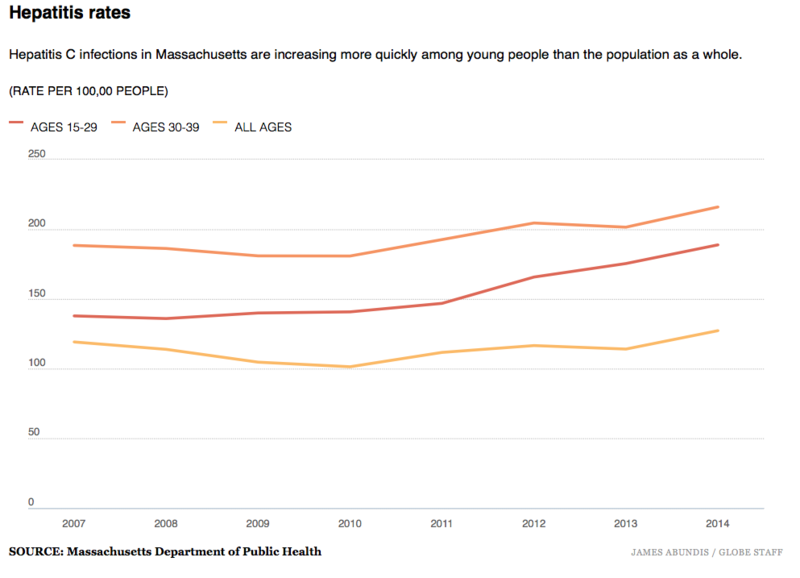 “The Center for Health Law and Policy Innovation of Harvard Law School analyzed plans sold on the Massachusetts Health Connector, the state agency for people who buy insurance on their own, most of whom have moderate to low incomes. The center found that in nearly half the plans, patients had to pay a higher percentage of the cost for hepatitis C drugs than for most other drugs. Some insurers require patients to pay half the cost. People who are on Medicare can obtain the drugs if they purchase a Part D prescription-drug policy, but those policies typically require deductibles, copayments, and sometimes prior authorization — all of which can limit access. Read “Hepatitis C patients often have to get sicker before insurance will pay for drugs” in full. View reports from the 2016 Qualified Health Plan Assessments. The New York State Attorney General has already taken some steps to find out why insurers are limiting coverage of pricey hep C meds to the sickest patients but has stopped short of suing companies for their decisions. Now, he’s stepping up his fight. New York Attorney General Eric Schneiderman’s office is suing health insurer CDPHP for breaking the law by delaying coverage of hep C treatments until patients are in advanced stages of the disease, The Times Union reports. The AG said in a suit filed in a state Supreme Court that the Albany, NY-based insurer did not pay for medically necessary care and deceived members about their coverage. CDPHP restricted coverage of hep C treatments because of how expensive they were but never told members in plan documents that cost would play a role in determining coverage. The insurer also did not reveal how it determines when benefits will be covered, which violates state health and insurance laws, the AG’s office said in its suit. “Forcing patients to wait for care, risking internal organ damage, is unconscionable and, as we allege in our lawsuit, violates the law and the company’s own policies,” Schneiderman said in the suit, as quoted by the Times Union. CDPHP is standing by its actions. The insurer’s hep C coverage is about the same as or better than that of other companies, spokeswoman Ali Skinner told the newspaper in an email. And CDPHP uses coverage guidelines similar to New York state’s Medicaid program, she added. The suit comes on the heels of more action from Schneiderman’s office. In March, the New York AG asked some of the country’s biggest insurers including Anthem ($ANTM) and Aetna ($AET) to hand over documents explaining how they make coverage decisions for pricey hep C meds. Hep C drugs promise a cure, but their list prices of about $1,000 a pill, or $84,000 per patient in the case of Gilead’s ($GILD) Sovaldi, have some insurers and payers reeling. Even when companies offer discounts of 40% or more, the cost of the drugs is too much for insurers to stomach. Some Medicaid programs have refused to cover the drugs at all. Meanwhile, patients are also pushing back at insurers limiting coverage of hep C meds. Earlier this year, two patients in Washington state sued insurers Group Health Cooperative and BridgeSpan for restricting coverage for hep C treatments. Insurers say the drugs are too expensive to cover, which then forces patients to wait for treatment, lawyers for the plaintiffs said at the time. “When an insurer limits coverage only to its sickest members, it amounts to an irrational and short-sighted rationing of care. From the perspective of an individual living with HCV who is excluded from the cure, that care is the very definition of ‘medically necessary,'” Kevin Costello, litigation director at the Center for Health Law and Policy Innovation at Harvard Law School, said in a February release. An editorial released by the Boston’s Globe’s editorial board on Thursday, April 14th, 2016, calls for insurance providers to allow unfettered access to the Hepatitis C cure for all living with the disease. “Don’t deny hepatitis C patients a cure” follows an article published in the previous Sunday’s Boston Globe, “Hepatitis C drug costs leave many without care,” which also includes quotes from CHLPI’s Robert Greenwald. “’If there was a cure for Alzheimer’s or multiple sclerosis and we restricted treatment, there would be a huge outcry,’ says Robert Greenwald, director of the Center for Health Law and Policy Innovation at Harvard Law School. Read “Don’t deny hepatitis C patients a cure” in full. An April 11th, 2016 article published by The Connecticut Mirror features commentary from Ona Balkus, Senior Clinical Fellow for the Harvard Food Law and Policy Clinic. The article, “Recycling Food Waste: Slow as Molasses,” explores the challenges of creating a statewide food waste recycling program while the amount of food waste has drastically increased in recent years. Read “Recycling Food Waste: Slow as Molasses” in full. An April 9th, 2016 article in the Boston Globe quotes CHLPI’s faculty director, Robert Greenwald, as it explores restrictions placed on access to curative medications for Hepatitis C (HCV) for patients enrolled in Medicaid. The article, “Hepatitis C drug costs leave many without care,” profiles various patients who were able to receive the the HCV cure after legal action against the state and patients who are still living with HCV and trying to fight against restrictions. “Hepatitis C treatment costs tens of thousands of dollars per patient. The illness progresses slowly over decades, so most states’ Medicaid programs control costs by treating the sickest first and requiring others to wait. Robert Greenwald, faculty director of the Center for Health Law and Policy Innovation at Harvard Law School, in February led a class-action lawsuit against the state of Washington, asserting its Medicaid program was illegally rationing hepatitis C drugs. Read “Hepatitis C drug costs leave many without care” in full.